This week is Sleep Awareness Week, a time to encourage better sleep to increase overall health and well-being. We all know how important a good night’s sleep is to our health. Regular sleep deprivation can increase the risk for many health issues, including high blood pressure, heart disease, diabetes, obesity, stroke and dementia. Quality sleep for family caregivers is critical as they can especially be at risk for sleep problems, including insomnia (the inability to fall or stay asleep), hypersomnia (problems staying awake), and poor-quality sleep. While taking care of a loved one, caregivers often get up in the middle of the night to help, or they stay up late to get their own chores done. Additionally, many family caregivers fall into the sandwich generation as they attempt to provide care to elderly parents and juggle the demands of young families and full-time careers. It can be a vicious cycle. Lack of sleep can lead to irritability and exhaustion. Depression, anxiety or fatigue from caregiving are common as well. When this happens, it can be extremely difficult to not only keep your own health in check but to properly take care of someone else. Sleep needs vary across ages and are impacted by lifestyle and health. According to the National Sleep Foundation, you must determine how much sleep you need and how you feel on different amounts of sleep by assessing not only where you fall on the “sleep needs spectrum,” but also by looking at what lifestyle factors are affecting the quality and quantity of your sleep. 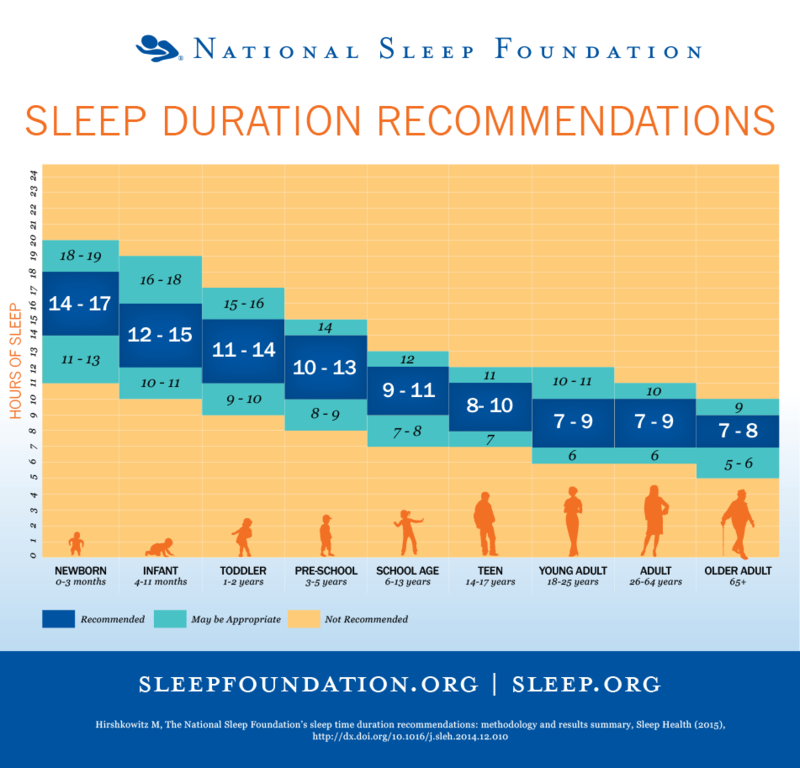 Though research cannot identify the exact amount of sleep needed by people at different ages, the National Sleep Foundation has developed a new chart that includes minimum and maximum ranges for health, as well as recommended windows and amounts experts agree upon. The National Sleep Foundation panel revised the recommended sleep ranges for the children and teenage groups. Check out the full Sleep Duration Recommendations chart here. Keep a regular bedtime routine and try to turn in around the same time each night. Keep your bedroom quiet, comfortable and at a consistent temperature. Turn off electronics – phones, laptops, tablets – before bed. Stay active and get regular exercise during the day. Avoid tobacco and alcohol and try to avoid caffeine late in the day. Try relaxation exercises, meditation or a warm bath before bed. Get help with caregiving. Share your caregiving responsibilities with other family members or consider hiring respite care to provide regular breaks. Proper sleep for family caregivers should be a priority. It’s not only necessary in order for you to take care of yourself, it is also necessary for providing quality care for your loved one. FirstLight Home Care sends professional caregivers into homes to provide compassionate non-medical home care. We help with everyday activities such as bathing and personal hygiene, meal preparation and eating, light housekeeping and laundry. We also offer Respite Care, giving family caregivers a much-needed break from their own caregiving role.